Google has been on a spree this last few weeks. First it was their foray into becoming the hub for social networks through OpenSocial. Today, it’s their launch of the Open Handset Alliance and Android. Android is the first truly open and comprehensive platform for mobile devices. It includes an operating system, user-interface and applications — all of the software to run a mobile phone, but without the proprietary obstacles that have hindered mobile innovation. We have developed Android in cooperation with the Open Handset Alliance, which consists of more than 30 technology and mobile leaders including Motorola, Qualcomm, HTC and T-Mobile. Through deep partnerships with carriers, device manufacturers, developers, and others, we hope to enable an open ecosystem for the mobile world by creating a standard, open mobile software platform. Basically, their mobile play looks very similar to their social networking play: become the nexus. This is similar to what I spoke about when in South Africa in May. I used the example of mashing up Mxit and Muti, and spoke about how you create layers of other services that all talk to each other. It’s about using open source tools to create your platform, this allows others to build on them easily. Best of all, it makes the end-user experience better. If you weren’t on board before, now you should be. 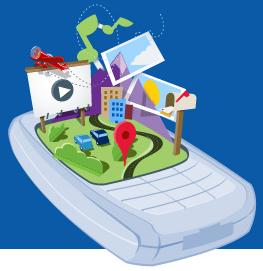 You can build right into the future of mobile. Sure, Android won’t be everything, but it’s a surefire way to get into the game. Louis, that’s an excellent question. I’m guessing that they’re feeling the same way that may web developers have in the past with Google. You’ve worked long and hard to make something and then Google comes out and with all it’s money and PR power and wins the day just because they’re the 800lbs gorilla. I’d love to hear what others from the OpenMoko community have to say on this too. I guess Google are really making moves. There is way too much proprietory technology in phones. This has benefited the mobile industry as they keep their stranglehold on the market and the profits. Nice to see Google being disruptive.